I've been neglecting the blog, but not the house. The William Morris wallpaper in the dining room is up. Can you believe it? As of last Sunday night, after a good-- how many? seven? weeks of working on it. It wasn't procrastination that made me take so long, it was waiting until I had an extra pair of hands available. I did a lot of it myself, but some places I simply needed a helper. Especially for the corners. I didn't like the way my previous method for turning them was eating up so much pattern. I found this method on YouTube and decided to try it. I succeeded at the first one, in the northeast corner-- eventually. But not after having the piece going onto the adjacent wall (all 5" of it) flop down on my head, onto the steps of the ladder, get stepped on, dirty, cat-haired . . . miracle it wasn't trashed. I cleaned it up, repasted it, and got it on the wall, but after that experiment I decided no more corners until I had help. That came in the form of my friend Lizzie*. Between my work schedule and hers it would run two or three weeks between the times she could come and help. And as the video says, the method takes time. Lizzie and I were lucky if we could pull a corner turn off in an hour. 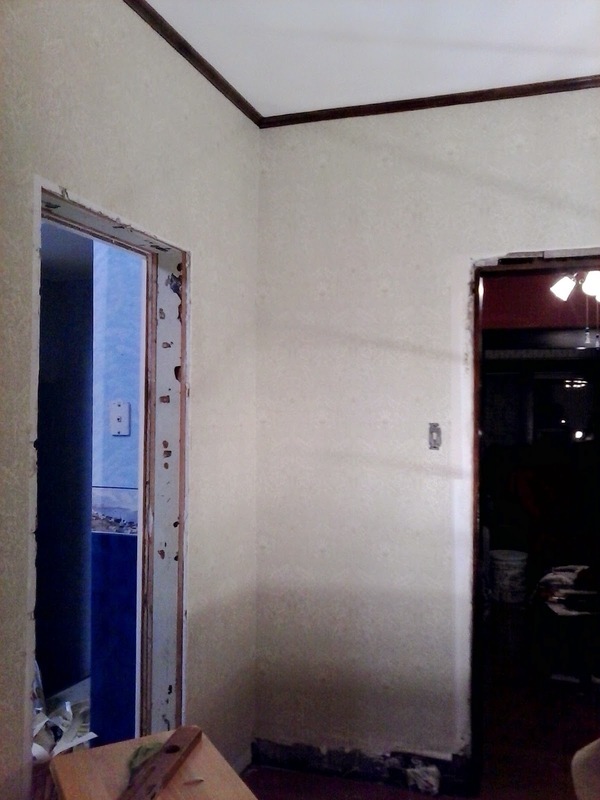 My walls are screamingly old and out of square and going around corners there was often a goodish amount I had to trim out of the piece going onto the adjacent wall. At the top, especially. That wasn't fun. I was afraid to use the X-Acto knife to trim it (as the paperhanger in the vid does at 11:00 min.) because I was afraid I'd cut through both layers. Instead I'd crease it with my thumbnail to give me a guideline for my scissors. The worklight doesn't cooperate at such times. It washes out the shadows and with my lousy eyesight the cutting was often hit-or-miss. Still, at eye level the pattern looks pretty darn continuous and matched. The scissors method doesn't work in the dead corner (southeast, in this room). There I sucked up my courage and used the craft knife to trim the last piece in the corner. Gently, gently . . . almost managed to do the whole cut without piercing through the bottom layer. Almost. Of course it had to be about six feet up, where the bookcase won't cover it. Trimmed an eensy piece of wallpaper and shoved it into the inch-long slot, to bring the top piece out and eliminate the shadow. It worked; at least, I have to be looking for it to find it. It was a toss up as to whether a given whole strip would go up peaceably or fight me all the way. The one after the turn around the northwest corner took Lizzie and me a good hour, just to get it matched. Not sure why. We blamed the settling of the house and let it go at that. Time and again the hanging got precarious. Too bad: trashing a strip and starting over with a new one was not an option. But this Britpulp is thick and pretty forgiving; you can even smooth down minor tears (not that I had more than one) so they're not obvious. In the end, I came out with a whole full strip to spare. Would have had a full, unopened roll had I given more thought to the cutting at the start, but them's the breaks. Since it takes me so blinking long to hang a strip I've had to cope with popped seams here and there. That's where an artist's detail brush comes in handy. I gently lift the loose edge, poke in some wheat paste, wait five minutes, poke in some more, wait another five minutes (normal relaxing and booking time for a Britpulp paper like mine), then gently smooth it down with a clean, just-damp sponge. All in all I think the installation looks good. I'm no pro but I'm getting better. Full strips matched up nicely with partial strips above and below windows, and in the dead corner the pattern's only off by a half inch (compare that to nearly an inch and a half in the living room). Except for a couple of unobtrusive places I don't have any overlaps, and there they face away from the light so you have to run your fingers over them to detect them. So now, at last, it's finished. I wish I could post better pictures. The "Savernake" pattern's so subtle it's impossible to catch on camera. But the color turns out to be fine. It changes depending on the time of day and the light, from cream, to yellowish, to off-white, to palest green, but never does it bellow "Celery green!!!" And the pattern makes the room look bigger. 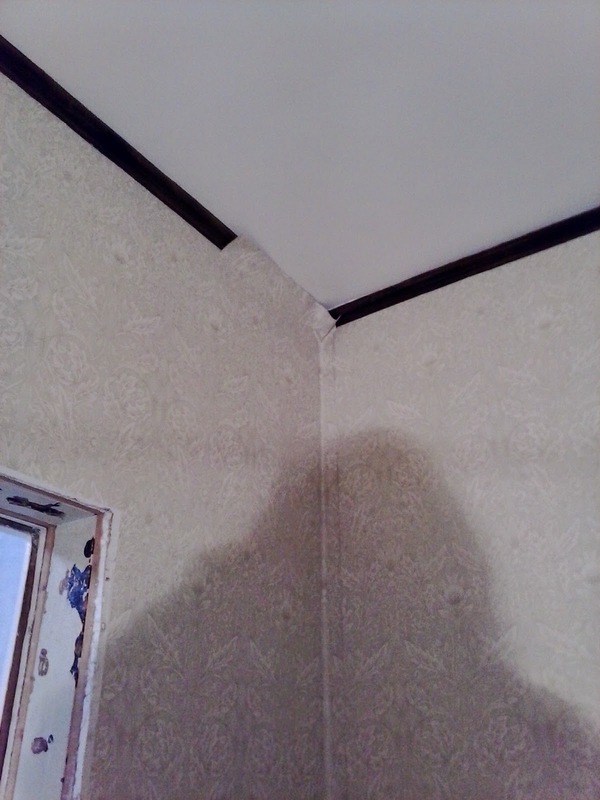 I've been shellacking and remounting the dining room window trim as the pertinent walls get papered, but that's another post.